50 years ago Major Arthur Mallock’s obsession with things mechanical lead to the building of a small lightweight racing car. Borrowing a slogan from the then popular body-builder, Charles Atlas “U2 can have a body like mine” Major Mallock sold these cars in various forms with this slogan and the Mallock U2 was born. 50 years on and the Mallock family are still building these cars, now up to Mk 35. This makes them the longest surviving racecar manufacturer in continuous production in the UK under the same family ownership. The Austin 7 Special, WJ1515, that Arthur Mallock raced before designing the first U2. Much of the running gear from this was used for U.2. Mk 1. The latest Mallock Mk 35s at Brands Hatch. So this year Mallock’s will celebrate 50 years of racing at a special event at Silverstone in England and closer to home at the Taupo Motor Sport Park in December, in association with the Historic Racing & Sports Car Club. Errol Norris from Christchurch had an agreement with Arthur and built Mallock cars in New Zealand. 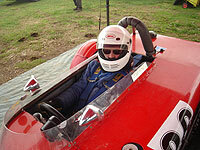 Numerous other chassis were built in the early 60s to 70s by Jack Oakley and others. In typical Kiwi fashion, a few more jumped on the bandwagon after seeing how well these little cars performed and several variations of Mallock type cars exist. Some of them quite famous in New Zealand sports car racing. A number of the later model variants are still very competitive in SCANZ racing today. The first weekend of December 6th/7th, sees the gathering of Mallock type cars to celebrate the 50th anniversary of these wonderful little cars. This will be at the annual HRSCC Picnic meeting held on the Taupo club circuit. There will be Mallock only races along with a parade and display of Mallock cars. Plus a gathering of people that own, have owned or had some interest in Mallock’s over the years. Anyone interested in attending the celebration should contact Bill and Susanne Stone (nee Mallock) stonesnzuk@xtra.co.nz or Alan Service albo@woosh.co.nz HRSCC. All welcome.